My best friend, Melly, has been thinking of a pie concept for a long time and we actually have been trying to perfect it for a year or so. She usually has these fun ideas/inventions and when she told me she wanted to make a individual pie that was like an ice cream cone, I was in! The hard part was making the cone shape out of dough. We failed a lot and then we discovered this pizza cone set on Amazon and it worked perfectly for baking the dough. We tried a lot of pie recipes too, and some were better than others. We finally found a nice yummy, flakey one that held the shape nicely and didn't crumble. We just loved the concept of eating pie with one hand or eating it with a fork if you wish! The pizza pie set comes with a pie cut out. I use it because it actually makes a nice size for a pie. 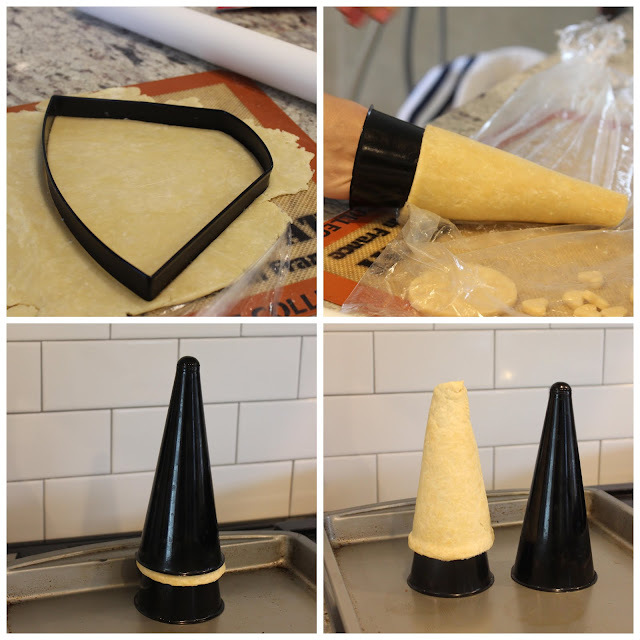 I roll the dough, cut out the shape out, and roll it onto the cone. 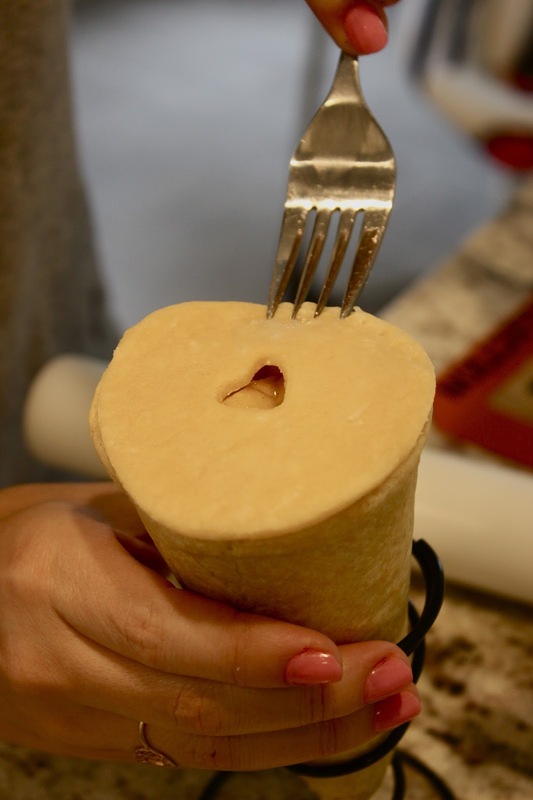 You can use premade dough or my favorite pie recipe from addapinch.com) You can butter the cone prior to rolling the dough onto it, but I don't since the dough is so buttery already and I find it easy to remove when it's done baking. The pizza set from amazon comes with 2 baking cones. I find that the pie cone bakes evenly if you actually place the second cone over your dough. I've tried a lot of methods and this one has been the best for me thus far. 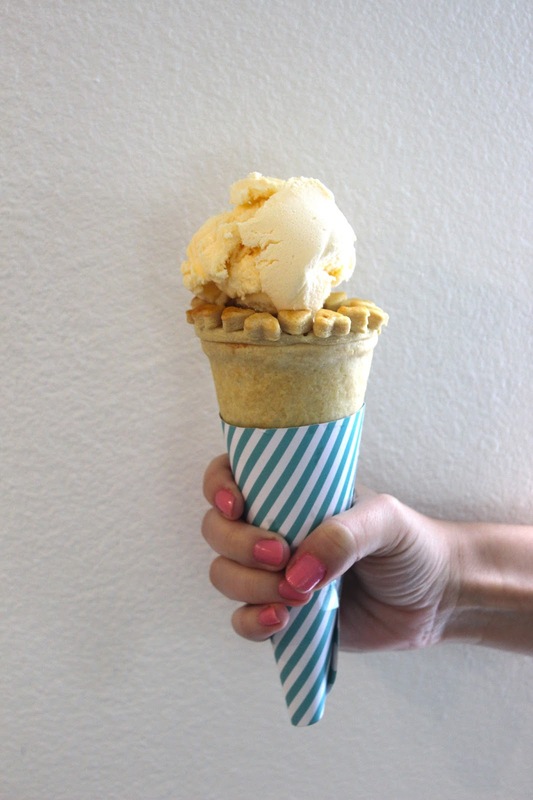 Whatever filling you want to fill your pie cone is up to you. I made a couple different kind. I made a lemon curd, and a apple pie filling. Make sure to make these in advance. 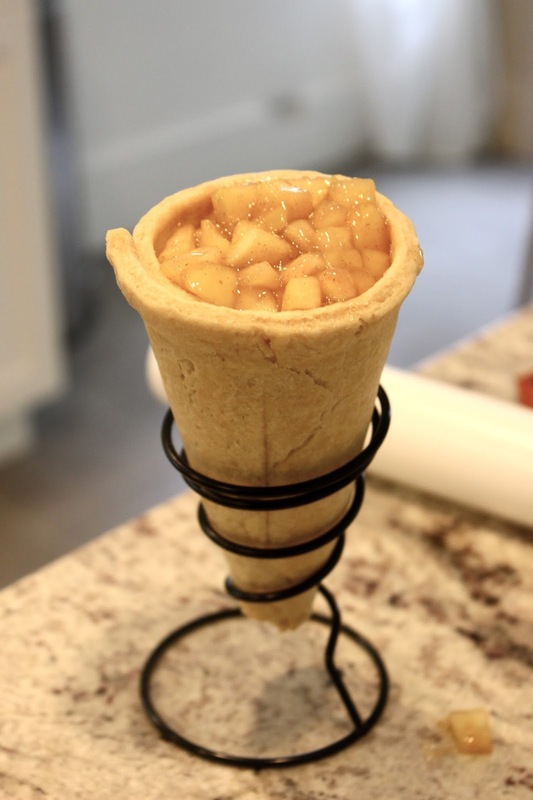 For the apple pie cone, wait til the cone is cooled, turn it around and fill it with the apple filling. Add a raw round dough top (like the picture above). The amazon set also comes with a spiral stand. The stand can actually be put in the oven, which works out perfectly to bake the top and filling right side up. Bake for 10 minutes. The filling and pie will be nice and warm! And an even yummier way to eat your pie, add a scoop of vanilla ice cream!! 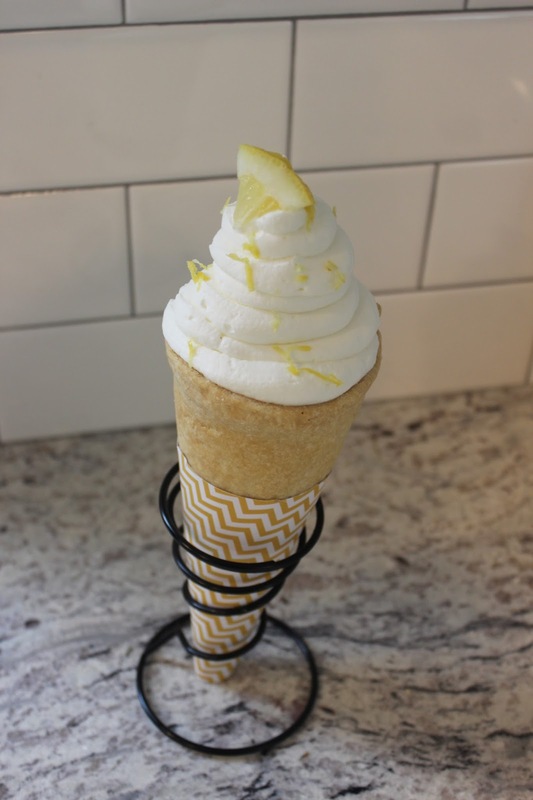 For my lemon pie cone, I filled the lemon curd in the cone once it was cooled. You don't have to put the lemon filling pie back into the oven since this once can be served in room temperature. 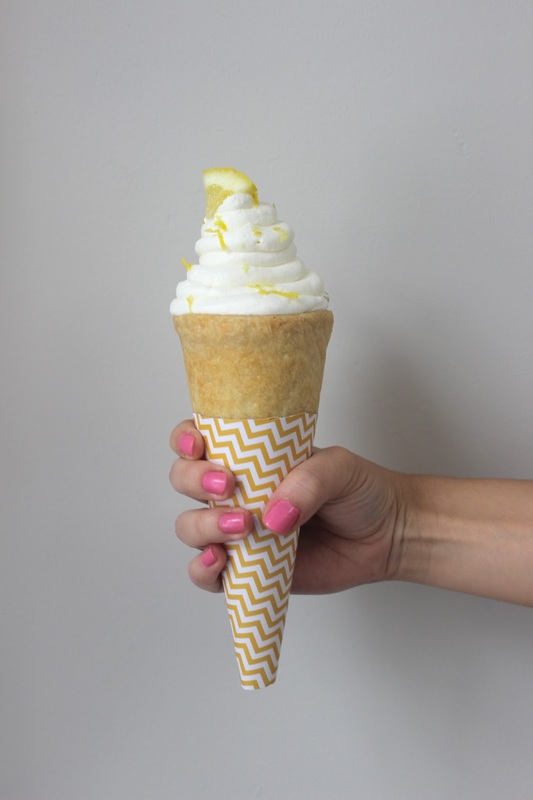 I didn't add a pie crust top to this cone but instead a whipped cream. 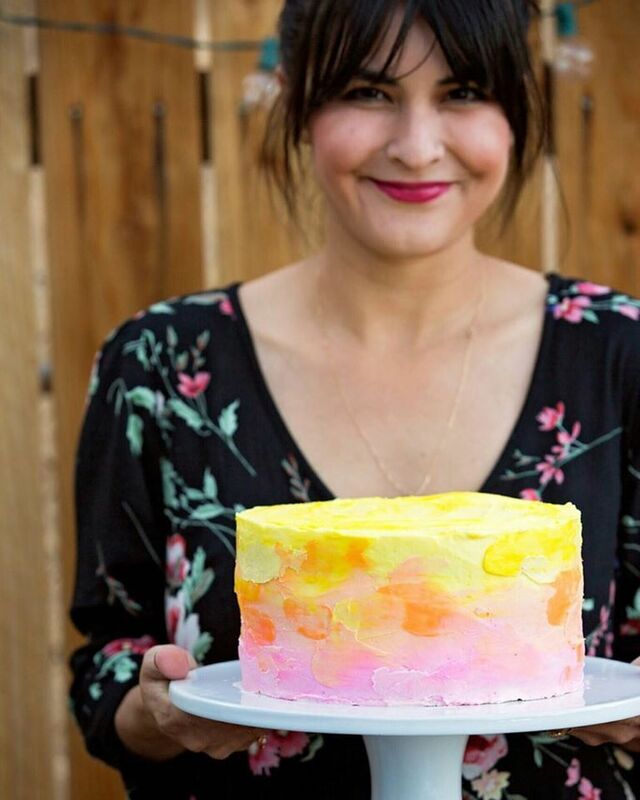 You can also do a meringue instead as well. 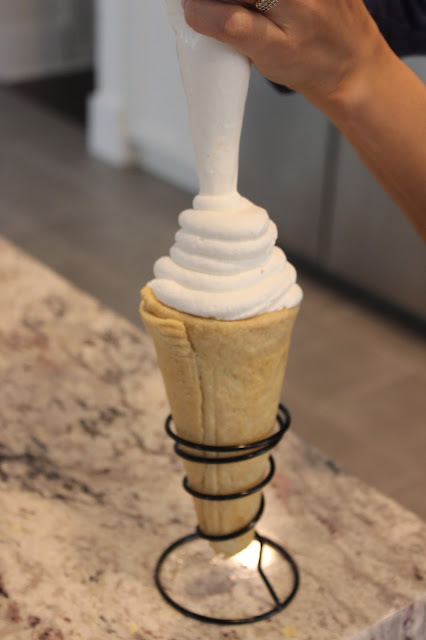 What I love about making these pie cones is that it mimics an ice cream cone, but with a yummy filling inside and a delicious flakey cone crust. And there you have it, our pie à la cone! It's been such a fun project and the pie flavors are endless!! Melly and I had a fun time working on these yummy cones! More fun flavors to come, so stay tuned!